Ever since I saw Back to the Future Part II in 1989, I’ve had dreams of riding a hover board. Twenty-five hover board–less years later, I had lost all hope of ever getting my feet on one, that is, until now. The hover board is here, and I have ridden it. 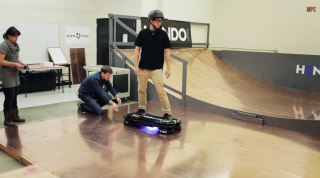 Check out our feet-on impressions of the Hendo Hoverboard in the video above. Created by California-based company Arx Pax, the Hendo hover board uses a magnetic field architecture to transmit electromagnetic energy. One downside here is that it needs a metal surface to hover. As someone who skates and enjoys digging his wheels into the ground to carve out the asphalt beneath me, I must admit that the hover board is much harder to control, since there are no wheels that grip anything. The board hovers almost an inch off the floor, and trying to turn on it generally leads to you falling off. The hover engines are also surprisingly loud. The Hendo Hoverboard currently hovers a little under an inch off the ground. In the grand scheme of things, however, the Hendo hover board is really just a proof of concept for a much more ambitious endeavor. The real deal here is what the technology can offer to the transportation sector, particularly trains. Arx Pax tells us that unlike the Maglev trains in Japan and Germany, its technology is much cheaper and much more maneuverable. So maneuverable that vehicles should be able to turn on a dime. In addition to transportation, Arx Pax sees its hover engines being used to one day levitate buildings. The company asserts that this could be used to protect structures in areas that are prone to earthquakes. It remains to be seen whether any of this will end up panning out as intended, but the company will soon be selling a white box developer kit with four hover engines that users can experiment with, for $200. If all else fails, hopefully we get some hover parks out of this.